Fanny is, as it were, the patron saint (or perhaps, goddess) of petanque. Ste Fanny priez pour nous! — Saint Fanny, pray for us! Being fanny (être fanny) means losing a game of boules or pétanque without scoring a single point— losing 13 to zero. (In the USA, we call that a “shutout” game.) Having to kiss Fanny is the ultimate humiliation for boules players everywhere. But it’s also possible to have a lot of fun with Fanny. In one version of the legend, Fanny was a waitress at the Café de Grand-Lemps just after World War I. She was so kindhearted that she would allow customers who had lost a game of boules without scoring a single point to kiss her… on the cheek. One day the village mayor lost a game and came to collect his “prize”. No one knows what prompted Fanny… perhaps she was unhappy with the mayor for some reason. She lifted her skirt and, one might say, turned the other cheek! The mayor never hesitated, though, and less than a second later two loud kisses resounded through the café. This was the beginning of a tradition that requires a player (or team) that loses a game without scoring any points to kiss the bottom of a girl named Fanny. 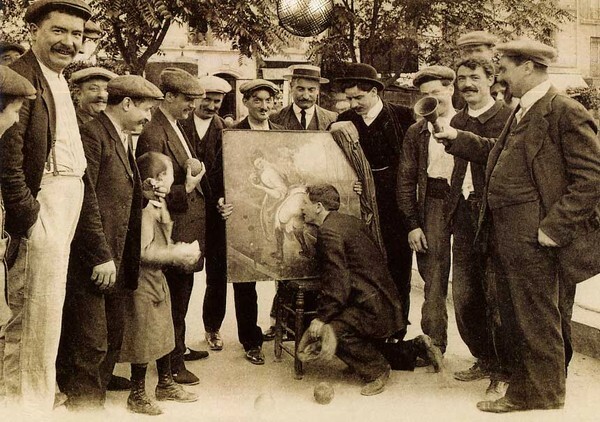 And that is why wherever boules is played in France, a painting or a poster or a sculpture of stone or pottery is proudly displayed… …ready to be kissed, in public, by the unlucky (malheureux) losers. Although Marcel Pagnol often wrote about pétanque, and the film Fanny includes a famous game, the tradition is unconnected with him. Like many mythical heroines, Fanny’s origins are a little murky. One version has it that she was a boules groupie in Lyon – the kind of girl whom today you might see hanging around soccer players. Another is that she was a café waitress in Isère. The Provençal version, which is naturally the the one I take as gospel, is that she worked in a bar overlooking the boulodrome in La Ciotat, where pétanque was invented. 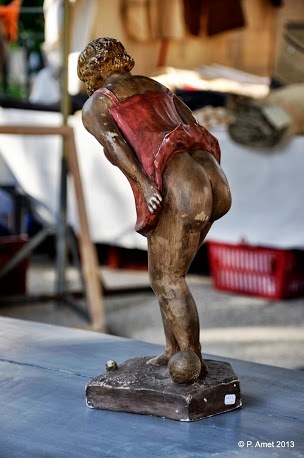 Although petanque players usually claim Fanny as an exclusively petanque icon, Fanny can be traced back at least to the mid-1800s when boule lyonnaise and other bocce-like boules variants were popular and petanque hadn’t yet been invented. One bocce web site claims that Fanny came into being in Lyon around 1860 — and has the pictures to prove it. Here is Fanny with bocce balls — or perhaps boules lyonnaises — not petanque boules. 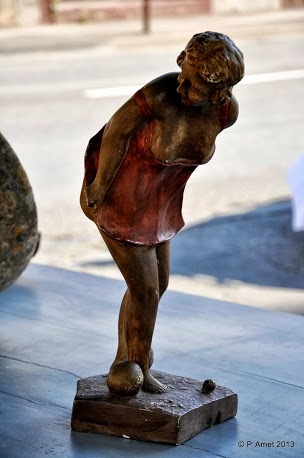 Perhaps the most charming representation of Fanny that I’ve seen is a little statuette that Patrick LeThorois photographed at an antiques fair in Isle sur la Sorgue. Again, note the large boules lyonnaises near her feet. The small ball in front of her feet is the target ball, the pallino. Here is a “shrine” to Fanny modeled on a traditional prayer bench (kneeler, prie dieu). Note the bell at the top. 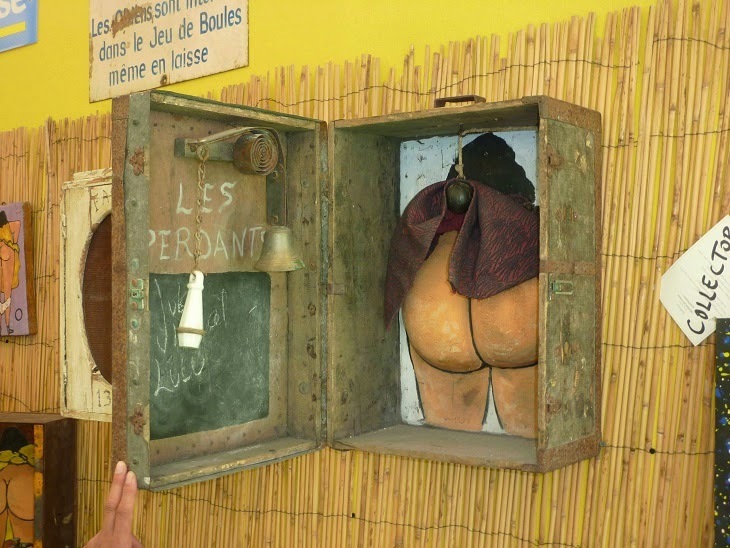 To see more of Fanny, visit this gallery of representations of Fanny, or the Fanny page at Musée de la Boule. This entry was posted in Traditions by Jules Lenoir. Bookmark the permalink. Where can I get a fanny poster? This is something that I also think about occasionally. I’ve tried googling “pétanque fanny affiche en vente” (petanque fanny poster for sale). This brings up a few hits on French eBay, mostly of very ugly and over-priced stuff. Seeing what’s for sale, I came to the conclusion that the best way to get a Fanny would be to make it myself. One possibility is to go to https://images.google.com, search for “fanny petanque” and find an image that you like, in the highest resolution you can find. Save the image to a thumb drive, take it to your local office supply store, and ask them to print out the image on their big color printer. In the past my local Office Depot store has made me 24″x24″ laminated posters for about $20. I’ve also thought about contacting a local artist and commissioning a terra cotta Fanny. It wouldn’t be cheap, but it would support my local arts community and I’d end up with a unique handmade Fanny. Priceless!